Alarm bells always start to ring when the cover of a performance of solo Bach gives the disc a moniker and prints it – and the name of the performer – in letters so large that the words ‘JS Bach’ at the bottom of the cover can do nothing but look like an afterthought. 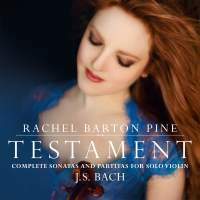 So it is a happy relief to find that the performance behind the cover of Rachel Barton Pine’s ‘Testament’ is one of the best of this set of peerless works to have been released since Isabelle Faust’s definitive volumes of 2010 and 2012. Although Pine’s performance is fundamentally different to Faust’s, it does display a similar quiet lack of egotism that doesn’t manipulate the listener into any conclusions. That is not to say that there is no sense of Pine’s own interpretation here, nor that it is a bland performance: there is a surprisingly striking contrast between its crystalline voicing, clear articulation and warm tone that makes the listener feel that it is concerned with the plain and simple beauty of the music as much as with the genius of its counterpoint and relationships between movements. All this is further supported by the sensible combination of Baroque bow and metal strings on a period instrument in modern set-up – the tuning is unfailingly accurate and the strength of the bowing means there is never any interference with the musical line by a squeak or break. As a result, the stillness she is able to create through the absence of any vibrato at the end of a select number of phrases (to particularly desolate effect in the Sarabande of the D minor Partita) is not only emotionally effective but also plainly informed by good performance practice study. All at the same time as presenting nothing to complicate the grace of the dance lines in the Partitas (in particular in the Bourrée of the E major Partita) or the clarity of the internal dialogue of the counterpoint in the Sonatas (as in the Prelude of the Sonata in C major). This apparent simplicity, which should not be confused with lack of insight (Pine has plainly studied these pieces from every possible angle), is particularly effective in the mighty Chaconne of the D minor Partita. It is the litmus test for any performance of these pieces, and where, if anywhere, a performer risks losing their interpretative nerve. Here, though, Pine is as steadfast as she is in the rest of the set: the complexity of the musical language is as transparent as it is anywhere else under her pared-down interpretation, creating moments of extraordinary beauty. These sparing touches, which under the fingers of many players can sound glib at best or contrived at worst, serve to finesse an already thoughtful and generous performance into something of great maturity and depth.